The Spring Framework is an application framework and inversion of control container for the Java platform. The framework's core features can be used by any Java application, but there are extensions for building web applications on top of the Java EE platform. I will create simple web application using SpringMVC +MyBatis + AngularJS to show Update data for View page. Create a folder named “jsp” under WEB-INF (This is where the jsp files will be created as indicated in the dispatcher-servlet.xml for the InternalResourceViewResolver bean). Whenever, Clicking on edit button it just shows the Update and Cancel button. <button ng-hide="editingData[userData.AppEmail]"class="btn btn-primary custom-width" id="addb"
// Click on edit button its shows the update and cancel buttons by depending upon the ng-click ID. Create packages each for the Spring Controller, Model and Service classes under the src/main/java folder. Also create a package for the MyBatis Mapper class under the same src/main/java folder. Create a POJO class named Student.java and StudentModel.java inside the package com.mybatis.model to include the details of the Student model entity during login. A Mapper in MyBatis framework is similar to the Repository tier in a Spring environment. Crude SQL queries takes its place here. 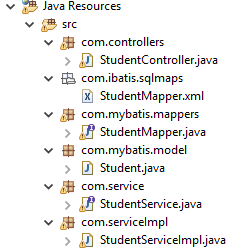 Create an interface class named StudentMapper.java inside the package com.mybatis.mapper to support the database operations. where Firstname, Lastname, Educationalqualification are the field names or column names in MYSQL DB and where class condition should be mentioned in ng-model name in view page. Create an interface class named StudentService.java inside the package com.mouri.service to support the service tier operations. either to select the student details into the database. RESTful Web services controller is the way the HTTP response body is created. REST Web service controller simply returns the object and the object data is written directly to the HTTP response as JSON/XML. //General method to convert JSON object to Map. //General method to convert JSONArray to Map. Whenever we run the application first of all it hits the service and then it pass the call to controller, where it will perform the required action and then calls the mapping resource in order to update the data in database which will turn and displays the data on UI part. If you want dispatcher-servlet.xml, web.xml, config.xml, please click to refer below link. A Sample snapshot as shown below.